BAKERSFIELD, CALIFORNIA (March 3, 2018) – Friday's sixth and final race of the 2017-18 inaugural Open Outlaw Kart series at Bakersfield Karting Experience saw Tate Sanders storm to his third consecutive victory while Larry Moody of Templeton did enough to win the series championship. 19 Outlaw Karts competed on the state of the art 1/10th mile dirt oval with three heat races and a B Main helping set the lineup for the 25 lap feature. Chris McKellar jumped out to the early lead with fifth starting Joey Yantis quickly into second. Sanders followed the pair for a three car breakaway throughout the feature. Moody ran as high fourth before dropping out of the race during a caution period. Sanders used the numerous restarts to take over second from Yantis and set his sights on McKellar. After several laps running nose to tail, Sanders dove inside down the backstretch to take the lead out of turn four. Sanders led the final three circuits for the $400 victory with McKellar and Yantis the top-three. Bryce Cooper finished a career-best fourth and Bryan Watson used a fifth place to finish just three points behind Moody in the final championship points. 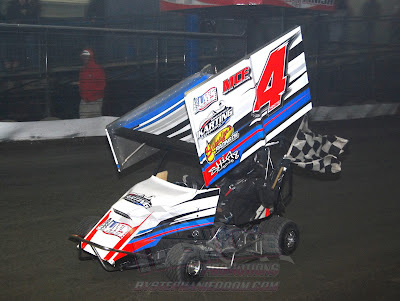 The 2017-18 Winter Series concludes with races on March 9th for Jr. and Sr. Mini Dwarfs, and March 16th with Stock Appearing and Open flat Karts. A 2018 Summer Series is currently in the planning stages as well. The state of the art facility is Bakersfield’s newest complete entertainment venue, with RC car racing, oval dirt kart racing, golf simulator, arcade games, and food and drink specials. BKE is open to the public 6 days a week with karts available for rent for a single race or for group outings. Birthday parties and private room rentals round out the extensive options for a night out or for a great get together. On Thursday, March 15th, NASCAR champion Kevin Harvick is returning to his hometown to race for the first time at Kern County Raceway in the NASCAR K & N Pro Series season opener. Harvick will also be the Grand Marshall of the NASCAR Late Model 50 lap race on the same night, prior to the start of the K&N Pro Series 175 lapper. Harvick won his first stock car championship in the Late Model division at Mesa Marin Raceway in 1993, while still attending North High. “The Happy Harvick 50” will feature the top NASCAR Late Model drivers in the region. Harvick will give the command to start the engines for the 50 lapper, and present the trophy to the winner of the race. The 2018 season opener for Kern County Raceway is set for Thursday, March 15th, featuring the NASCAR K&N Pro Series and NASCAR Late Models, tickets are on sale now at www.kernraceway.com. Kevin Harvick will be racing in the “Bakersfield 175 presented by NAPA Auto Parts” his first race ever at the state of the art half mile, gates open 4:30pm, and racing begins at 7pm. MADERA, CALIFORNIA (February 28, 2018) – Lifestyle brand NICERIDE out of San Diego, CA is the latest company to partner with Madera Speedway for its 2018 MAVTV-televised racing season. 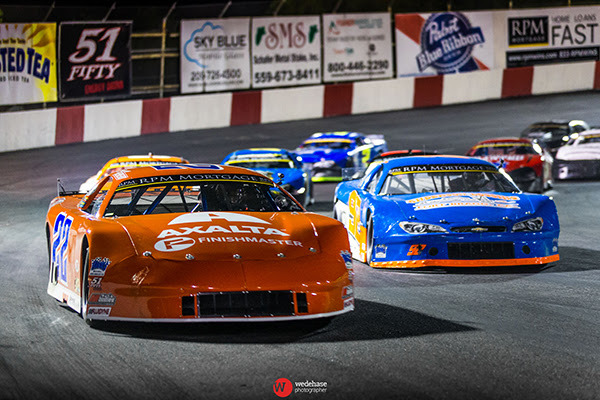 NICERIDE will be highly visible during the RPM Mortgage Pro Late Model Series and 51FIFTY Energy Drink Jr. Late Model Series races, presenting bonus awards during the halfway TV break at each event. 18 MAVTV telecasts will be filmed at the one-third mile speedway this year over the course of nine nights of Pro Late Model and Jr. Late Model competition. Each Pro Late Model race is at least 80 laps, with a break during the competition for teams to make adjustments on the front stretch and for the top-five to conduct TV interviews. Awards from NICERIDE will be handed out during this break. All nine Jr. Late Model races are 80 laps this season as well. NICERIDE was founded on a vision to create a clothing brand that embraces all walks of life, locally, regionally, and worldwide. Since 2013, NICERIDE has set out to promote a lifestyle that emphasizes the three most important aspects of our lives - Family, Friends, and most importantly Fun! 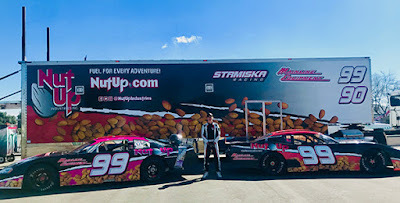 The 2017 campaign at Madera Speedway was one of its most successful stock car seasons in track history, with a season long average of more than 40 Late Models on the grounds each race. New sponsorships look to propel 2018 to even greater heights. It all begins on March 10th with the RPM Mortgage Pro Late Models racing for 100 laps and $5,000 to win, while the 51FIFTY Energy Drink Jr. Late Models battle for 80 laps. BAKERSFIELD, CALIFORNIA (February 27, 2018) – Brad Pounds will try to add another championship to his dirt resume, when the Bakersfield Karting Experience hosts the Open Outlaw Karts for their 2017-18 Winter Series finale on Friday night. 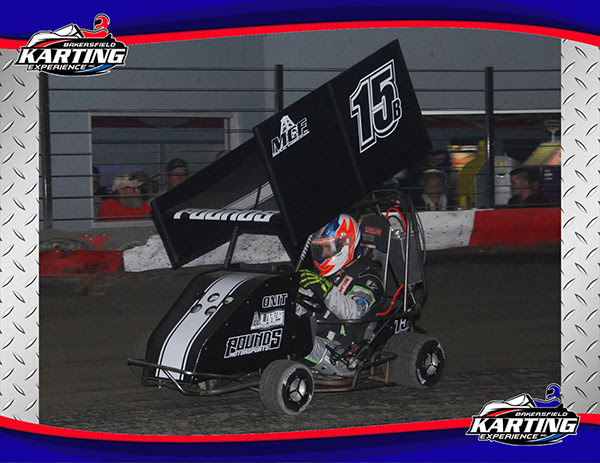 Pounds scored the opening night of the Bakersfield Indoor Kart Nationals in January then added a third place finish last Friday as part of his efforts to lead the points. 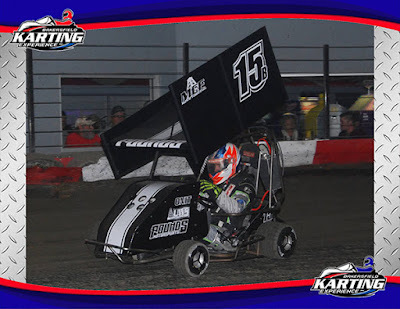 The Bakersfield Karting Experience 1/10th mile indoor dirt oval has thrilled fans with a great winter season of racing for Mini Dwarfs, Outlaw Karts, and flat karts. The Outlaw Kart series has averaged 20 entries per event in its inaugural season. Friday’s conclusion is expected to attract another strong field of competitors, with last Friday’s victor Tate Sanders the only repeat winner in the series. Sanders’ two wins leads Pounds, Ethan Dotson, and Tim Randolph as other winners this season. The 25-lap feature for the Open Outlaws will pay $400 to win out of a $1000 purse. General admission tickets will be $10 on Friday night. Pit gates open at 2 p.m. with drivers meeting at 6:30 p.m. and racing at 7 p.m. Pit passes are $20. BKE is a state of the art facility and Bakersfield’s newest complete entertainment venue. RC car racing, oval dirt kart racing, golf simulator, arcade games, and food and drink specials are all on the menu at the complex. BKE is open to the public 7 days a week with karts available for rent for a single race or for group outings. Birthday parties and private room rentals round out the extensive options for a night out or for a great get together.